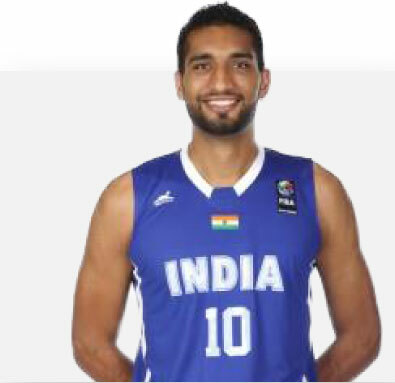 Amritpal Singh is the traditional late bloomer story, discovered due to his height at 19 years old, he went from helping his father plough a rice field to captaining the Indian National Team during the most recent 5th FIBA Asia Cup held in Wuhan, China. An extremely quick learner, Amritpal was selected to his first Indian National Team at the age of 20 to compete in the 26th FIBA Asia Basketball Championship in 2011, only one and half years after picking up the ball for the first time. Under the tutelage of International expert coaches, he has progressed over the past 3 years to become one of the best big men on the Asian circuit, developing a variety of post-moves through quality footwork usually only showcased by guards and can shoot from 17-19 feet out on regular basis. He posted a double-double, 20 points and 11 rebounds, against the American Centre Marcus Douthit of Philippines and dominated the middle during India’s historic victory over China during the 5th FIBA Asia Cup.